I mentioned in an earlier post that I’ve taken over the role of Entomology Sub-group Leader for one of the conservation groups on Salisbury Plain. Each month I lead a BeeWalk in Area 15 which is one of the artillery impact areas in SPTA (C). Earlier in the year we plotted a 5km transect through a variety of habitat and each month a small group of us follow this route and count and identify the bumblebee species we find. The data is uploaded to the Bumblebee Conservation Trust (BBCT)BeeWalk website. More info about BeeWalk here. In addition to the bees (which so far have not been numerous) we always find something interesting and this time it was the freshly-emerged Marsh Fritillary Euphydryas aurinia. The day was overcast, great for macro photography in my opinion, as the clouds act as a giant softbox, but there was a real nip in the wind so they were rather sensibly keeping well hunkered down in the grass. To get this shot I had to lie on my belly and wait for opportunities for the wind to drop. Low light can be a problem so inevitably it was necessary to push up the ISO to 800. 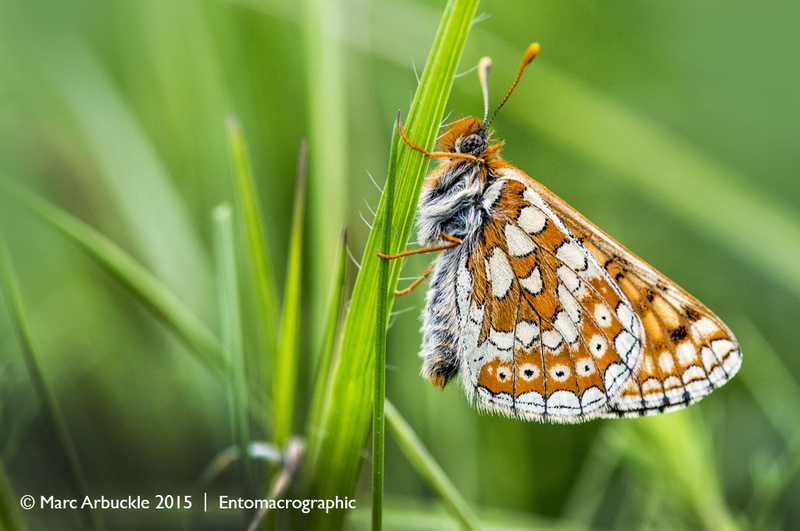 As many of you will be aware the Marsh Fritillary has declined in its distribution right across Europe, and is now a protected species and therefore the object of much conservation effort. Fortunately Salisbury Plain remains one of its major strongholds in Wiltshire, the UK and Europe. Perhaps on my next visit, if it is a little warmer, I’ll get lucky and capture a few images with the wings open. I would very much like to talk to you about your marsh fritillary photo as soon as possible. It’s a beautiful shot and I’d love to use it in Wiltshire Life. Would this be possible?